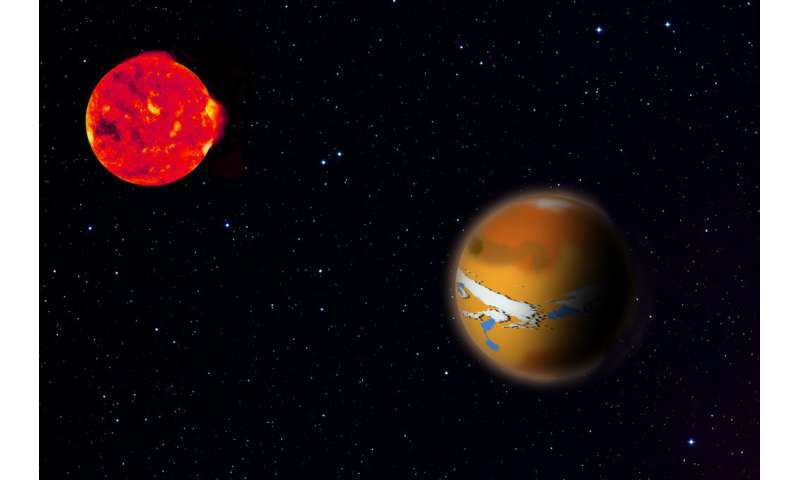 New simulations show that the search for life on other planets may well be more difficult than previously assumed, in research published today in the journal Monthly Notices of the Royal Astronomical Society. The study indicates that unusual air flow patterns could hide atmospheric components from telescopic observations, with direct consequences for formulating the optimal strategy for searching for (oxygen-producing) life such as bacteria or plants on exoplanets. Current hopes of detecting life on planets outside of our own Solar System rest on examining the planet's atmosphere to identify chemical compounds that may be produced by living beings. Ozone – a variety of oxygen – is one such molecule, and is seen as one of the possible tracers that may allow us to detect life on another planet from afar. 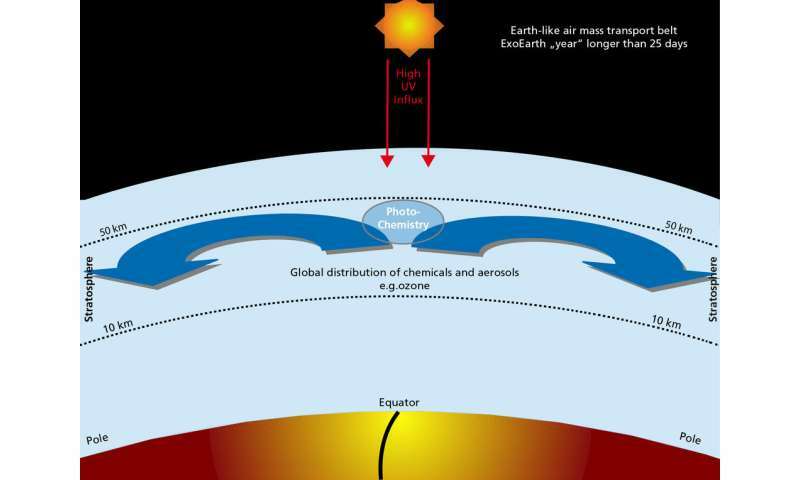 In Earth's atmosphere, this compound forms the ozone layer that protects us from the Sun's harmful UV radiation. On an alien planet, ozone could be one piece in the puzzle that indicates the presence of oxygen-producing bacteria or plants. But now researchers, led by Ludmila Carone of the Max Planck Institute for Astronomy in Germany, have found that these tracers might be better hidden than we previously thought. Carone and her team considered some of the nearest exoplanets that have the potential to be Earth-like: Proxima b, which is orbiting the star nearest to the Sun (Proxima Centauri), and the most promising of the TRAPPIST-1 family of planets, TRAPPIST-1d. These are examples of planets that orbit their host star in 25 days or fewer, and as a side effect have one side permanently facing their star, and the other side permanently facing away. Modelling the flow of air within the atmospheres of these planets, Carone and her colleagues found that this unusual day-night divide can have a marked effect on the distribution of ozone across the atmosphere: at least for these planets, the major air flow may lead from the poles to the equator, systematically trapping the ozone in the equatorial region. Carone says: "Absence of traces of ozone in future observations does not have to mean there is no oxygen at all. It might be found in different places than on Earth, or it might be very well hidden." Such unexpected atmospheric structures may also have consequences for habitability, given that most of the planet would not be protected against ultraviolet (UV) radiation. "In principle, an exoplanet with an ozone layer that covers only the equatorial region may still be habitable," Carone explains. "Proxima b and TRAPPIST-1d orbit red dwarfs, reddish stars that emit very little harmful UV light to begin with. On the other hand, these stars can be very temperamental, and prone to violent outbursts of harmful radiation including UV." The combination of advances in modelling and much better data from telescopes like the James Webb Space Telescope is likely to lead to significant progress in this exciting field. "We all knew from the beginning that the hunt for alien life will be a challenge," says Carone. "As it turns out, we are only just scratching the surface of how difficult it really will be." "the most promising of the TRAPPIST-1 family of planets, TRAPPIST-1d"
Maybe, but I still like the specs for 1e and 1f better than 1d based on their more Earth-like sunlight levels (isolation) and slightly friendlier UV environments. Note that the sizes for 1e and 1f have been revised downwards, but they are still likely to be between Mars and Earth in size. Okay, I can tentatively accept the conclusions put forward by the writers of this article. Until further data is available. However, I am very unhappy with the choice of terminology such as "Earth-like". Not just by this project but by all of us in general. Honestly, I also have failed to think of a more accurate word to describe those worlds we speculate to be habitable by Earth-type lifeforms. In addition to my moral qualms against the eagerness of many commentators to engage in genocide of Not-Earth biospheres and dooming their future evolution. Which brings us to PanSpermia. There is an unsubstantiated claim that Russian scientists assert that they have found alien bacteria on old hull-scrapings from the ISS. But we are not allowed to see any experiments performed to prove that claim. The relevancy here is again terminology. Describing the alien life as "bacteria"? Frankly, that stinks to the high heavens. Alien, should be Alien until proven otherwise!